S ikhs singing sacred hymns from Guru Granth Sahib in a church! It may sound strange. But the relentless efforts of some Amritsarite Sikhs have made this unique instance of communal harmony a reality. 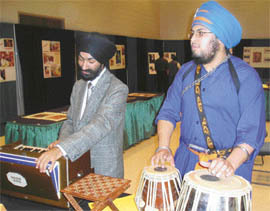 Divine melody: US-born Harjas Singh (right) and Sameep Singh (left) perform kirtan during Sikh Exhibition, 2005, held at Wright State University, Ohio, USA. After having a round of the exhibition held in the university premises, the American judge Greg Singer described it (the festival of harvesting) as one of his favourite American festivals. Fascinated by Sikhism, he said the story about the “Beloved Five” and the forming of the Khalsa was his favourite and inspiring story. CLose on the heels of highly successful Indian Idol show, round-the-clock musical channel MH1 launched Awaaz Punjab Di for talent hunt among Punjabi singers. More than 1500 enthusiastic aspirants thronged Guru Nanak Auditorium here recently to try their luck in singing. The Indian Academy of Fine Arts (IAFA), Amritsar, organised a musical programme Ghazal-The Queen of Indian Music on May 29. The highlight of the programme was that in addition to rendering ghazals, a brief history of the genre of poetry was also narrated to the audience. FOR the first time in the city, a young artist Anchal Bhrany held an exhibition of Tanjore glass paintings. She displayed 25 works of this art, known for its delicacy, precision and expense. Magician Shankar, hitting out at people describing magic as something occult and superstitious, said that it was a pure form of art, which could be mastered with intense practice and focused concentration. THE municipal corporation’s role has once again come under a scanner. Rajinder Singh, brother of Jasbir Singh, an NRI from Germany who met a dreadful death after falling into a deep pit at Dhab Khatikan on the night of May 9, has demanded action against the municipal corporation’s top officials. NOW the Indian middle class can convert its dream about holidaying abroad into a reality as SOTC, India’s leading tour operator, has announced a strategic tie-up with the State Bank of India. DR T.S. Chahal, the founder director of the Institute of Development and Planning, first of its kind in Punjab, has the distinction of working in the fields of education, research, extension and administration at different levels in various reputed institutes of the country and abroad. Students of Government Secondary School, Maloo Nangal, nearly 10 km from here, took part in different activities like physical fitness, martial arts during the month-long summer camp that concluded on June 12. The topper in the Punjab State Education Board matriculation examination, Raghav Kapoor, a student of DAV School, Hathi Gate, says hard work, family’s support and elders’ blessings are a must for success. Belonging to the family of businessmen, he was groomed as a hard working, obedient and religious-minded boy by his grandfather Jawahar Lal Kapoor, a retired defense account officer. THE Bagh Ramanand Welfare Association has complained of increasing menace of rats and poor sewerage system. THE ICICI Bank inaugurated its first extension counter at Khalsa College here last week. Mr Satyajit Singh Majithia, president, Khalsa College Governing Council, inaugurated it. The extension counter will provide the entire range of the ICICI Bank products and its technology-oriented services, including phone banking and net banking to customers. WITH the municipal corporation and the bank authorities remaining silent, the case relating to fake NOCs submitted to Punjab National Bank allegedly for obtaining loans remains unsolved even after a year. THE city of Brampton, with 35 per cent Punjabi population, has offered to provide the latest technology to manage solid waste to the holy city. Various NGOs working in the field of environment promised to join hands in saving environment during a seminar organised on the occasion of the World Environment Day. Keeping faith alive: Kirtan in progress at a church in the United States. Sikhs singing sacred hymns from Guru Granth Sahib in a church! It may sound strange. But the relentless efforts of some Amritsarite Sikhs have made this unique instance of communal harmony a reality. The recitation of hymns from Gurbani and the singing of Jagat jalandaa rakh lai aapne kirpaa dhaar and Jo maangeh thaakur apunay tay in an American church in the United States of America was a tribute to the spirit of communal harmony and brotherhood. In their endeavour to create awareness about the principles of non-violence, the Dayton Sikhs joined the 7th Annual Season for Nonviolence and Peace to remember Martin Luther King Jr and Mahatma Gandhi for their contribution in forging world peace. The programme was held in the Chapel of the United Theological Seminary. On this occasion, the Sikhs were invited especially to pray for the world peace. All present in the church thanked the Sikhs for being a part of this event, and expressed their willingness to learn more about Sikhism and visit the gurdwara in Dayton. It was indeed a great occasion for Sikh boys and girls. There is yet more. A small group of Amritsarite boys, including Sameep Singh Gumtala, Tejdeep Singh Rattan and Simarpreet Singh Rattan (all cousins), deserve kudos for getting Punjab’s Baisakhi – the famous festival — recognition from Americans. The joyous music and dance marking Punjab’s New Year is now celebrated on the soil of America with same fervour and zeal as in the land of its origin. The Sikh Exhibition on the occasion of Baisakhi was organised for the first time at Wright State University (WSU), Ohio. Dr Dan Abrahamowicz, vice-president of the Student Affairs and Enrolment Services, WSU, paid tributes to Guru Gobind Singh on the occasion and said that the exhibition had greatly increased his understanding about Sikhism. Visitors also enjoyed gatka (Sikh martial art) performed by young artistes Harjas Singh and Gurshan Singh of Cincinnati, and energetic Punjabi folk dance bhangra performed by student and guest artistes. While Sikhs have suffered due to many cases of ‘mistaken identity’ after 9/11 attack on twin towers, the scene of turban-tying session by Englishmen in America definitely came as a pleasant surprise to the community. The American girls did not lag behind; they also evinced keen interest in wearing turbans — thanks to the efforts of Amritsarites. Some of the American youths did not shave their beards for more than three months to present themselves as gabhrus (youths) from Punjab and attended their classes in the university. The Sikhs have been in the United States for almost a hundred years, and because of their multifarious qualities and open-mindedness, they have earned recognition at their work places. Despite their long and significant stay in the United States and the fact that the Sikhs have served the allied forces during World War I and II, many people still mistake a Sikh for a person from the Middle East. The Sikhs suffered the most during the backlash period of September 11th when they were mistaken as followers of Osama Bin Laden. The hate crimes claimed the life of innocent Sikh Balbir Singh Sodhi. This crime sent shock waves among the Sikhs. Realising the need to share the heritage, the Sikhs from Dayton decided to reach out to public in order to make people aware about the Sikh faith and culture, and to make them have a better understanding of the Sikh religion. Amritsar-born Dr Kuldip Singh Rattan, Professor in the Department of Electrical Engineering at Wright State University, Dayton, Ohio, along with Tarn Taran-born Dr Darshan Singh Sehbi, Assistant Professor, School of Medicine, approached the media to tell them that 99 per cent of the turbaned people living in the US were Sikhs and that they were peace-loving people and they had no connection with the 9/11 incident. They then participated in different inter-faith activities. 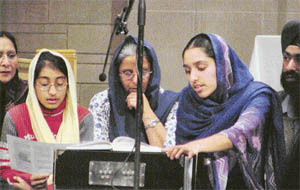 Dr Rattan made a presentation on the “Manifestation of universal peace and the concept of universal brotherhood in Sikhism” at the Religious Founders’ Day on November 14, 2001, in Dayton. In March 2004, the Sikh Student Association, headed by Sameep Singh Gumtala, was formed at Wright State University with a purpose of introducing and promoting awareness of the Sikh faith, culture and identity among students and faculty of the university. The association planned events, seminars and lectures to highlight the Sikh vision and spirit, and engaged in dialogue with student representatives of other faiths to propagate acceptance, mutual respect and appreciation of other beliefs. The man behind these events has been Sameep Singh Gumtala, currently a PhD student in Electrical Engineering at Wright State University, and his cousin Tejdeep Singh Rattan, who is doing master’s degree in Human Factors Engineering from the same university. Simarpreet Singh Rattan, who also hails from Amritsar, received his Bachelor of Science in Electrical Engineering in June 2005. All three of them prepared exhibits covering wide ranging topics about Sikh history and culture, teachings of Sikh gurus, status and role of women in Sikh history, message of universal brotherhood, importance of sewa in the Sikh way of life, Sikh warriors, the contribution of the Sikhs in World War I, II and India’s freedom struggle, and distinctive quality of turbans worn by the Sikhs. Appreciating the efforts, Richard Perales, the then Mayor of Beavercreek, Ohio, said that he had enjoyed his close association with the Sikh community. Recalling his association with the Sikhs, he said he was impressed by the concept of langar. “It is inspiring to see people, irrespective of their status, partaking of the food during langar,” he said, while recalling his first visit to the Dayton gurdwara. He also said that he was amazed to see Amit Singh, son of Dr Kuldip Singh Rattan who played American football for Beavercreek High School, serving common kitchen (langar) to the congregation with humility and devotion. Interestingly, these days the Sikh wedding has also become a topic of discussion in the Wright State University Center for International Education (UCIE). The university’s coffee hour held every Friday provides students a platform to meet people of different countries and explore their cultures. One such coffee hour was about “Weddings in different cultures”. The presentation included Swedish and Sikh Indian weddings. Using power point slides, posters and videos, Simarpreet, an engineering student, highlighted various aspects of wedding, starting with elaborate pre-wedding preparations by families and relatives of bride and groom. Video clips of bhangra and gidha depicting the festive mood during a wedding were shown. The audience appreciated the presentation on anand karaj — the ceremony of bliss — which is something very unique and auspicious in a Sikh marriage. The spokesman of MH1 channel said that all 1500 contestants were given a chance to perform in front of eminent Bollywood playback singers, including Jaspinder Narula, Hans Raj Hans and Sumit Ahuja. He said 16 male and female singers each had been selected to contest in the quarterfinal to be held in Delhi in the next two months. Jaspinder Narula, talking to the Tribune, said that it was a matter of concern that Punjabi singers these days were emulating pop stars without understanding the fundamentals of sur and taal. She added that during the audition held at Chandigarh last night where over 2000 singers had assembled, only two could make some impact. Recalling her experience of audition, she said the present talent scenario among youngsters was rather dismal. She said that without proper training and practice under the able guidance of gurus, it was not possible to learn the basics of classical music which formed the foundation of a good singer. She said Punjab had raw talent which needed to be chiselled to make star singers. She said that she, along with Punjab’s famous sufi singer Hans Raj Hans, was contemplating to start a music institute in Punjab. Hans Raj Hans, echoing similar sentiments, said it was high time that government and NGO patronage was given to promote Punjabi folk music, which had rich tradition and was now lost in the din of Western music. The director of MH1, Sachin Ahuja, said the channel had launched the biggest talent contest for creating a platform for aspiring Punjabi singers. The contest would be held at Amritsar, Ludhiana and Delhi. He said after two qualifying rounds, the final round would be held at Delhi on October 29. He said they would select the best singers among boys and girls, and would spend Rs one crore to promote them. The IAFA had been organising various programmes on visual art with the collaboration of various other organisations, but it was for the first time that it produced its own programme. Dr Parminder Singh Grover, a medical practitioner by profession, narrated the history of ghazal. “Ghazal had its origin in the tenth century in Persia and the famous poet of the Mughal era, Aamir Khusro, has the credit for writing the first ghazal in India in the thirteenth century,” he added. He said the last Mughal King, Bahadur Shah Zafar, himself a great poet, patronised the genre of ghazal and it flourished under him. In fact, the all-time great ghazal writer Mirza Ghalib flourished in his rule. Anil Kumar Razdan regaled the audience with Ghalib’s ghazal Ishaq Par Zor Nahin Hai. Balwinder Grover presented a ghazal in her mellifluous voice. The other performers, who enthralled the audience, were Krishan Baldev (tabla), Amit Razdan (harmonium), Surinder Kakkar and A.S. Chamak. 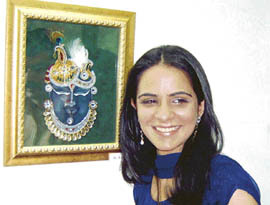 Anchal has experimented with Persian floral designs (seen on carpets), besides abstracts, profiles of English women, Tirupati Balaji artwork, ornamental patterns, jewelled peacocks, although traditionally the themes of Tanjore art were mainly mythological, with figures of Lord Krishna in various poses and pranks depicting various stages of his life. The exhibition, held recently at the All India Fine Arts Gallery, was inaugurated by Prof Darbari Lal, Deputy Speaker, Vidhan Sabha. The characteristics of the Tanjore paintings are its brilliant colour schemes, decorative jewellery with gems, stones, pearls and cut glasses, sarvoski work, zircon diamonds and embossed work of gold. Glass, instead of canvas, is used for painting, as the glossiness of glass adds shine and enhances its aesthetic beauty. It has compounded gold paste for embossed work, which further enhances the sharpness, clarity and detail. The paintings are made by “gilded and gem set” technique — a technique in which gold and sparkling stones are used to highlight aspects of paintings like ornaments and attires to create a three-dimensional effect. It gives an impact of glowing presence even in a semi-dark environment. These brands of Tanjore paintings can aptly be referred to as “Nellai Paintings”. The Tanjore art originated in Thanjavur (south India) during the reign of the Marathas in the 16th century. Crafted with meticulous care, the paintings are unique and expensive. What sets them apart are the embellishments made over the basic drawings with precious and semi-precious stones as well as the relief work which gives them three-dimensional effect. 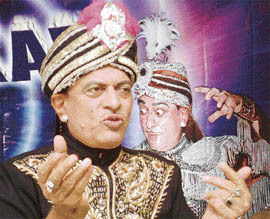 Seeking the incorporation of the art of magic in lalit kalas, he said it was born and developed in ancient India. 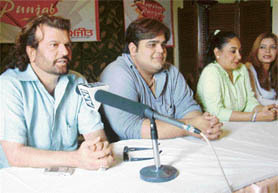 Considered as one of the top four magicians in the world, Shankar, while talking to Amritsar Plus, said that the star magician of the USA, David Copperfield, had learnt the art from India and had been duly recognised by the American Government, which had promoted his talent for pure entertainment purposes. Shankar, fondly known as Jadugar Samrat, said that magic was based on tricks. A high level of concentration, however, was required. He revealed that hypnotism was also used in magic. He said concentration and hypnotism could be mastered with the help of yoga and meditation. Talking to this correspondent, he informed that he had written to the government to grant him a piece of land either around Delhi or near Chandigarh to set up a full-fledged academy. He said providing a proper training to budding magicians, who were keen to pursue magic as their profession, could revitalise the vanishing art of magic. He is in city these days to hold a series of shows beginning from June 17 at Sangam theatre. So far he has organised 25,000 shows, out of which 19,000 were charity shows. An active member of the Red Cross Society, he has so far contributed Rs 1.50 crore for various relief purposes. Hailing from a business family of Sri Ganganagar, he joined the profession at the age of 12 after witnessing the show of famous magician Dev Kumar. Later, he learnt the art under the tutelage of famous magician B.N. Sarkar, whom he considers as his guru. Simultaneously, he continued his education and completed his M.Com. He gave his first show in 1974 in his hometown Sri Karanpur. Besides holding shows in the country, he has given presentations in the UK, Malaysia, Singapore, Thailand and Nepal. The master magician said that the art was passing through a rough patch owing to the onslaught of satellite channels, which had “dwarfed” the performing art. He added that his aim was to remove the misconceptions related to the art of magic. The municipal corporation’s role has once again come under a scanner. Rajinder Singh, brother of Jasbir Singh, an NRI from Germany who met a dreadful death after falling into a deep pit at Dhab Khatikan on the night of May 9, has demanded action against the municipal corporation’s top officials. He has also demanded compensation for the alleged gross negligence of the department. He alleged that the department that was expected to provide civic amenities to citizens had itself faulted. “The department must take responsibility for the grievous failure that led to my brother’s death,” he said. The municipal corporation had suspended a JE, Mr Nirmal Singh, two days after the incident. However the deceased’s brother asserted that it was not enough and added that although an FIR was lodged in the case, but top officials had managed to go scot-free, while a lower level person was suspended following the unfortunate happening. He stated that top officials of the department be made accountable for the “grave negligence” that had led to the loss of precious human life. Mr Surinder Kumar Billa, president, All India Hindu Shiv Sena, alleged that despite several reminders to the municipal corporation over months, the deep pit near a Government High School at Dhab Khatikan was not filled up. “Not even a signboard has been put to warn commuters,” he said. Due to the absence of streetlight there, it is pitch-dark there at night. On that fateful night, the victim fell into the pit along with his scooter. He died on the spot, according to post mortem report. The deceased owned a pub in Germany. Mr Rajinder demanded that such “negligence” on the part of departments should be taken seriously and action should be taken at the highest level. He urged that compensation be paid for the grievous loss to the family that had lost an earning member due to the “negligence” of the department. He threatened of legal action in case the officials were not brought to the book. This exclusive tie-up would be a part of the SBI’s easy travel loan scheme. Customers of SOTC and the SBI would be able to take holidays abroad and pay back the amount in easy monthly installments (EMI) over a period of 12 to 48 months. Mr Ashish Kishore, Business Head, SOTC Vishwa Darshan, said, “It is indeed a pleasure to have a tie-up with the State Bank of India. Our customers will be able to experience SOTC Vishwa Darpan holidays through the easy EMI route. The EMI for different tours ranges from Rs 1674 to Rs 2742, and Rs 4148 to Rs 5954 for the Far East and the European tours, respectively, per month per family consisting of husband, wife and a child below 12 years of age. The General Manager, SBI, Amritsar, said the maximum loan amount up to Rs 2.5 lakh could be paid over a period of 48 months, and the rate of interest which was originally at 12.75 per cent had been reduced to only 11 per cent. The customers would also be entitled to a free foreign travel debit card, and no prepayment charges would be levied. He further said no processing fee would be charged from the customers who booked their holidays under the scheme till August 2005. He said the loans would be available to employees of government, reputed public sector undertakings and private limited companies, self-employed engineers, doctors, architects with a business of two years, and aged up to 60 years only. Dr T.S. Chahal, the founder director of the Institute of Development and Planning (IDP), first of its kind in Punjab, has the distinction of working in the fields of education, research, extension and administration at different levels in various reputed institutes of the country and abroad. World-famous agricultural scientists, noted economists, social scientists, professors, engineers, teachers and research scholars from different universities, colleges and institutes are associated with the IDP, established in 2001. The renowned agricultural scientist, Dr S.S. Johal, former Vice-Chancellor, Punjabi University, Patiala, is its chief patron. Socio-economic research is pivotal, says Dr Chahal. The main objective of the IDP is to study the development process and the problems of the country; carry out policy research on emerging thrust areas concerning development and planning; to work for the development and education among rural and deprived sections of society and to undertake socio-economic surveys and extend consultancy to different organisations. Dr Chahal worked as an agriculture officer, Sabah, Malaysia, for three years and as head of the Post Graduate Department of Agricultural Economics. He also served as Registrar and Dean, Faculty of Agriculture, Khalsa College, Amritsar. He has authored two books and also got published his numerous research papers and articles in different journals, magazines and newspapers. He has also been a member of the Editorial Board of the Indian Journal of Agricultural Marketing, Nagpur. The Maharaja Dalip Singh Trust, with the help of the school, organised the camp free of charge for the overall development of students. The students of the school took lessons in yoga, meditation and martial arts, including gatka, judo and karate. 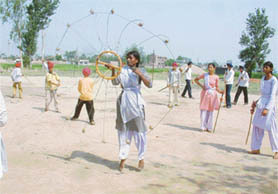 Besides, they were trained in folk songs, bhangra, patriotic songs, plays, declamation contest and general knowledge. To sensitise the students about the deteriorating environment, experts delivered lectures on various topics. The students were also taught gardening. On the concluding day, Dr Balwant Singh Dhillon, Head, Guru Nanak Studies, Guru Nanak Dev University, delivered a lecture on the contribution of Maharaja Dalip Singh and Thakur Singh Sandhawalia in the freedom struggle. An exhibition of the items and work done by the students during this period was also held. Mr Sukhdev Singh Sandhawalia, camp convener, said it was the second year of organising the camp, and they had decided to make it an annual feature. Talking to the Tribune, Raghav said his family encouraged him to do chanting from Gita to become a complete person. He had participated in the Chinmaya Mission’s Gita Chanting Competition and the national level meet held at Chennai two years ago. He said the success he had achieved in the board examination was due to the unflinching support of his school teachers and family. Earlier, the school had organised a function to honour 29 state merit holders from the school. The programme was presided over by the Deputy Speaker, Punjab Vidhan Sabha, Mr Darbari Lal. Speaking on the occasion, Mr Darbari Lal said the entire state and the city was proud of the achievements of the students. He also distributed cash awards to all toppers. Principal of the school, Mr J.P. Shoor, while appreciating the performance of the students, announced that the school would provide to the toppers all facilities, including free of cost books, stationery, uniforms, along with tuition fee, during their next two years of study in the school. Residents, in a letter to the municipal corporation, have alleged that sewerage system in the locality has become worst due to the apathy of the municipal corporation. The association president Surinder Singh Gandhi and general secretary Jagdish Singh have alleged that the rat menace is so pronounced that sewerage pipes have become rat-infested. They alleged that rats had not only punctured pipes that had led to severe contamination of water supply, but also they were also causing much damage to old buildings. The foundation of several buildings in the area was at risk. The residents alleged that despite several reminders to the municipal corporation, the department officials had not taken any notice of the problems being faced by them. The area residents also pointed out that sewerage manholes constructed in some places were about six inches above the road level, making them hazardous for commuters, especially at night. Meanwhile, reports of rat menace have also emerged from Katra Ahluwalia, Lala Wali Gali, Kutcha Kalyan Dass Bhatia, Dharek Gali, despite the “rat control” exercise undertaken by municipal corporation a few months back. Reports of rats digging near electric and telephone poles, sewerage pipes and open drains are also coming. The residents of these areas have demanded the spraying of anti-rat pesticide in manholes and sewerages to control the rodents to some extent. The health department says that the anti-rat drive would soon be started in the areas. It will remain open for customer transactions from 8 am to 8 pm six days a week. It will offer the entire range of the ICICI Bank products, including a comprehensive range of deposits, home and personal loans, mutual fund and demat services to cater to different customer profiles and needs, said the bank spokesperson. The bank has a base of more than 10 million customers who operate through a multi-channel delivery network of over 530 branches and extension counters, 1890 ATMs, call centres and Internet banking. The ICICI Bank is India’s second largest bank with an asset base of Rs 1252.29 billion, as on March 31, 2004. The bank provides a broad spectrum of financial services to individuals and companies. This includes mortgages, car and personal loans, credit and debit cards, corporate and agricultural finance. As many as seven NOCs issued by the municipal corporation out of the total of 10 were found to be ‘fake’ upon investigation by Mr S.C. Jindal, IO of bank’s Inspection and Control Division, New Delhi. The corporation’s Municipal Town Planning Department — the authority to issue NOC for the purpose of building — denied having issued any such NOC. However, neither the bank nor the municipal corporation has taken the matter to the police, even as some alleged agents of banks, LIC and other loan agencies continue to take advantage of the absence of ‘verification’ or ‘monitoring’ of such documents. Mr K.S. Kang, MC Commissioner, said it was for the bank authorities to take suitable measures, as municipal corporation had denied the issuance of any such document to the loan claimants. Addressing the press conference, Mayor Sunil Dutti, who returned here this morning after a ten-day visit, said that Brampton’s acting Mayor John Sprovieri had offered to transfer the know-how for using the solid waste to produce gas and power to meet the energy needs of the city. He said Brampton, a township, was ten km away from Toronto. It provided the best civic amenities to its population. Mr Dutti said the civic authorities there had also offered services for sewerage system. He said a team of experts from Brampton would visit the city to explore more possibilities of active cooperation during the next two to three months and a group of top officials of the corporation would also tour the Canadian city for cementing the existing friendship agreement. The agreement was signed by the three mayors of Punjab — Ludhiana, Patiala and Amritsar. It offers to celebrate the common cultural community linkages, besides exploring economic development, cooperation initiatives, including trade promotion, strategic alliances, investment opportunities, economic research exchanges and entrepreneurial developments. Mr Dutti said Punjab Chief Minister, Capt Amarinder Singh, who also accompanied the delegation, had agreed to this joint support programme for the development of civic amenities and accepted the offer of Canada. Impressed with the development model of the city, mayor said that 50 per cent of Rs 1500 crore revenue was generated from the property tax collection. Various NGOs working in the field of environment promised to join hands in saving environment during a seminar organised on the occasion of the World Environment Day. The seminar was organised by the Kheti Virasat, an organisation working in the field of organic farming and water related issues, in association with NSS Department of Guru Nanak Dev University. The NGOs expressed their deep concern over the increasing environmental problems in the city and the lack of concern of the people towards saving the environment. Speaking on the occasion, the representatives of these organisations stressed on the joint and collective efforts of all NGOs in this direction. The other organisations that participated in the seminar included the Lok Kalyan Samiti, the Pollution Control Society, the Amritsar Vikas Manch, the Param Vaibhav and the Aghaaz. The environmentalists passed the resolution to support the weak organisations for strengthening them and issue a common plan of action regarding environmental problems. Mr Jagmohan Singh of the Lok Kalyan Samiti said that in the last two decades the pollution had increased manifolds in the district due to which a number of diseases had become common. He said the holy city was still waiting for the sewerage treatment plant to be installed. He said that sewerage water having huge amount of heavy metals was being used for irrigation purposes which was damaging the human DNA. The local Shri Ram Ashram Senior Secondary School has achieved 100 per cent result in matriculation examination conducted by the Punjab School Education Board. Pardeep Jaggi of the school secured 90.3 per cent marks, while Pratibha Grover and Vandana Verma bagged merit positions by securing 87.5 per cent and 85.2 per cent marks, respectively. As many as 87 students of the school got first division. Pardeep Jaggi got 100 per cent marks in mathematics and 92 per cent in social studies, while Rajesh and Rachna secured 97 per cent in Hindi. Ginesh and Rajesh got 87 per cent in science and 86 per cent in English, respectively. Dr Harbilas Rai and Ms Ripu Daman, Principal of the school, congratulated the students and teachers for their hard work. Sukhpreet Singh, a student of Radical Coaching Institute, got 10th rank in the state in the All India Engineering Entrance Exam (AIEEE) this year. As many as 26 students of the institute had secured a place among the top 300 in Punjab. This was informed by the spokesperson of the institute in a press release issued here. The staff and students of Government Girls Secondary School, Putlighar, organised an awareness rally on the occasion of the World Environment Day. They distributed pamphlets among the people, urging them to save environment. Ms Sarabjit Kaur Sandhu, Principal of the school, speaking on the occasion, called upon the people to be ecologically conscious. Ms Inderjit Kaur, Assistant District Guidance Counsellor, District Education Office, and Mr Girish Kumar, District Coordinator (Vocational), and Mr Tarsem Saini, Chairman, Human Rights Society, also participated in the rally.